If you are anything at all like almost every scuba diver I have ever met, the idea of getting certified and exploring the underwater world was about the coolest thing you could imagine doing when you first signed up for your certification class. If you are like me, you remain an active diver. But a surprising number of certified divers drop out. They make a handful of dives or take a few trips, and that’s it. If there’s one thing I could fix, it’d be the “diver dropout” problem. In my personal experience, the folks who stick with scuba diving are the ones who do more than just swim around underwater. They stay in the game by keeping themselves engaged and interested — and challenged — by taking up underwater photography or videography, or getting involved as citizen scientists taking marine life surveys. They participate in research projects and they take specialty courses to increase their knowledge and skills. Some get involved in diving safety. Some pursue the paths toward becoming divemasters and instructors. Some become equipment specialists, and so on and so forth. The takeaway message I’d like to emphasize here is one you certainly heard in your entry-level certification class: Your c-card is your license to learn. It is the beginning, not the end of your diving education and activity. The call to action is straightforward: As the calendar turns to a new year, take this opportunity to drop into your favorite dive center and see what courses and activities they offer. I bet you will be surprised at your options. Another good idea is to look into how you can get involved as a citizen scientist making a contribution to all kinds of scientific research through organizations such as the Reef Environmental Education Foundation (REEF, reef.org) by taking marine life surveys on your dives. It’s fun, highly educational, and you are bound to make some new diving friends along the way. Take my suggestion, and my bet is that a year from now when you look back on where your diving life is today and where it is a year from now, you will very happy with yourself and your diving year in 2017. 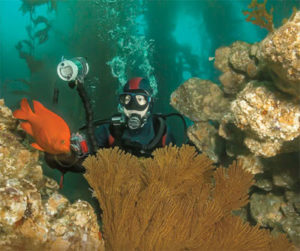 Happy New Year from all of us at California Diving News!